NASA says it's seen strong interest from potential international partners in its lunar exploration plans, such as contributions to the proposed Lunar Orbital Platform - Gateway, formerly the Deep Space Gateway. WASHINGTON — There is significant interest in NASA's new lunar exploration plans from potential international partners but the country can't take its position of leadership for granted, an agency official said March 5. "It's clear the U.S. is a leader throughout the international space community. That really came through our work with the space station," he said. "As we look forward and do things around the moon, we're going to have to keep a strong international presence." One area of cooperation, he said, is in development of life support systems for the Gateway, citing interest from the European Space Agency and the Japanese space agency JAXA. NASA, he added, also has plans to develop life support systems, "so we'll figure out some way there" for cooperation among agencies. Another area of interest, he said, is in developing lunar lander capabilities. NASA has plans in the near term to partner with companies developing small commercial landers, and ultimately develop larger landers. But there are few details about how NASA, working with commercial or international partners, might develop those larger landers in the 2020s. "I don't think we fully understand all the requirements that we need to do a human-rated lunar lander today," Gerstenmaier said. He noted the Apollo-era Lunar Module wouldn't meet current NASA safety requirements. Early small lunar lander missions in this new architecture could "tease out" those requirements for human-rated landers, he said. In addition to identifying missions and technologies on which countries can cooperate with NASA, the agency is working to develop standards for deep space technologies. 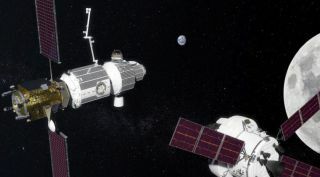 NASA announced March 5 a set of draft interoperability standards that the agency and ISS partners developed in the areas of avionics, communications, environmental control and life support systems, power systems, rendezvous operations, robotics and thermal systems. Gerstenmaier said he passed out information about those proposed standards at the ISEF2 meeting. "This is a way we're going to set for the international community to operate with us," he said. "Moving forward, this is U.S. leadership. We have set the standard for the rest of the world to follow." He added that there is "really strong" interest in cooperation from nations outside the ISS partnership. "We're trying to create an environment where any space agency, no matter how small they are, can participate and find a niche," he said. He cited as examples of that interest the presence of a large delegation from Luxembourg at the ISEF2 meeting, as well as cooperation with the United Arab Emirates as that country selects its first group of astronauts. One issue may be finding roles for all potential partners on the Gateway and related lunar projects. "The problem's going to be that there's more international interest than the Lunar Orbital Platform – Gateway can really accommodate, so we're going to have to open the trade space up and see if they want to contribute in the transportation area or if they eventually want to contribute in the landing," Gerstenmaier said. Another cautionary point, he said, is concern by partners in the shifting directions of NASA's space exploration plans over the last decade. "We are clearly the partner of choice that other countries want to work with," he said. "But, they also recognize that we change our minds, we think differently, we get redirected." That's led some partners to consider alternatives, opening up opportunities for them to cooperate with China on its planned space station and other exploration plans. "They're hedging their bets and they're talking with China," he said. "If we don't show leadership, and we don't show some consistency of purpose, and we don't show that we really have a plan moving forward that makes sense to them, they will be ready to pivot to the Chinese at the right time."